Interface meters and probes can be used in numerous applications including measuring oil and water levels in monitoring wells, detecting tank leakage and obtaining accurate measurements of water levels. When a interface meter is lowered down a well and contacts a product layer, a signal is activated on the reel. 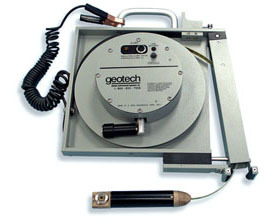 Geotech offers a variety of designs so that you can choose the perfect interface probe or meter for your site requirements. 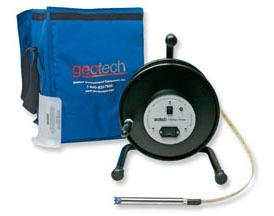 Geotech Interface Meters can be used in numerous applications including measuring oil and water levels in monitoring wells, detecting tank leakage and obtaining accurate measurements of water levels. When the Geotech Interface Meter is lowered down a well and contacts the product layer, a solid tone and green light alarm is activated on the reel. When the probe detects water, the tone begins to oscillate and the light changes to red. 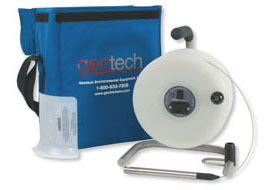 The Geotech Interface Probe with ORS-Style Frame accurately measures depth to hydrocarbons and water in monitoring wells and tanks by using an optical prism to detect hydrocarbon layers as thin as 1/200' (1.52mm). 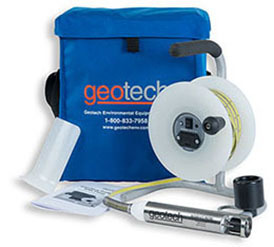 The Geotech Interface Probe With Float is a portable, reel-mounted instrument that provides measurements of liquids lighter and heavier than water. When the probe is lowered down a well and contacts the product layer, a solid tone and red light alarm is activated at the reel. When the probe detects water, the tone begins to oscillate and the light changes to green.